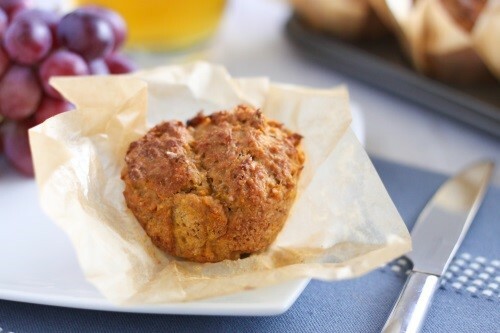 If you’ve ever dreamed of eating muffins for breakfast, these spiced sweet potato muffins are the thing for you! Made with wholemeal flour and sweet potatoes, they’re hearty and filling, yet perfectly portioned for breakfast. The fragrant spices give the illusion of sweetness without needing to use too much sugar, so they’ll keep you going until lunch. First, cook the sweet potatoes in a microwave until soft, turning every few minutes – this will take approx 9 minutes. When cooked, cut them in half, and set aside to cool. Meanwhile, combine the wholemeal flour, Baking Powder, light brown sugar, spices, and a pinch of salt in a large bowl. Mix well. When the sweet potatoes are cool enough to handle, scoop out the flesh, and add it to a separate bowl. Mash thoroughly, and add the melted coconut oil, egg, Greek yogurt, and Madagascan Vanilla Extract. Mix well. Combine the wet and dry ingredients, and carefully mix until well combined. Place 10 muffin cases in a muffin tray, and lightly brush them with oil. Divide the muffin mixture evenly between the 10 cases. Bake for around 35 minutes, until fairly firm, and browned on top. Leave to cool on a rack before serving. (Hint) To cut down on preparation time, use leftover sweet potatoes from the previous night’s dinner.